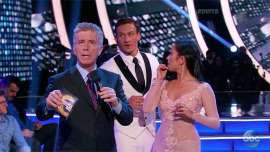 US swimmer Ryan Lochte, who was banned for 10-months following his Rio lying scandal, was almost attacked on Dancing With The Stars live show. 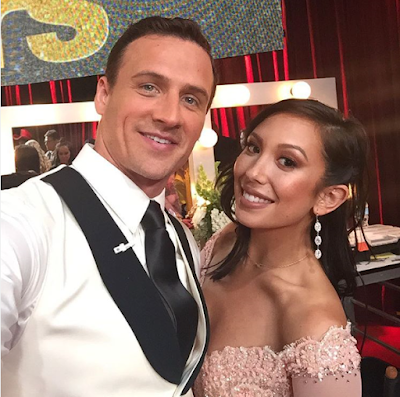 The embattled Olympian was on the dance floor with his dance partner Cheryl Burke for the usual judges' session when 2 anti Lochte protesters crashed the stage in the middle of judge Carrie Ann Inaba's critique. Judge Inaba was saying "This is a place for second chances. What you bring to this ballroom is all we want to see," when she stopped midsentence as hecklers could be heard in the background. She continued by saying "And I really do feel that you brought your best to this ballroom. You have a long way to go. Swimming is a -- excuse me! Hey, back off!" As 2 men crashed the stage trying to reach Ryan Lochte. An eye witness said they were screaming 'liar' and one of them ran on stage towards Lochte but he got tackled by security. Inaba's facial expressions, though she barely spoke, said volumes about what was happening in front of her eyes. Tom Bergeron the host abruptly threw to commercial break, we saw a shaken Burke and Lochte unsure of what just happened. 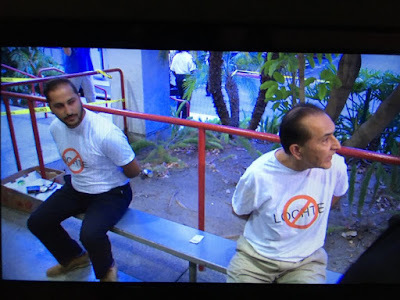 Another eyewitness said that two male protestors ran out onto the stage, tearing their shirts off to reveal anti-Lochte shirts underneath while the swimmer was on the dance floor during the judges' critique. Security immediately intervened, tackling them to the ground and detaining the men with some kind of a restraint. Another source inside told ET that a row of protesters, wearing the same anti-Lochte shirts, also stood up in the audience. The source says that Derek Hough spotted them and had them thrown out. The source tells ET that Leah Remini's husband, who was seated with the former DWTS guest host in the front row, also jumped up to help. "First of all, wow," Inaba said after DWTS returned from a long commercial break, still in shock over what had just transpired. Bergeron addressed the scare by calling it a "little incident." "Thank you to our security team for staying in shape," he said. When Bergeron asked Lochte how he was doing after the scary scuffle, he responded: "I'm good." "So many feelings are going through my head right now." "A little hurt but I came out here. I wanted to do something that I didn't feel comfortable with and I did and I came out here with a big smile. "he admitted, with a camera pan to his mom who was visibly emotional.